Feeling Christmassy yet? 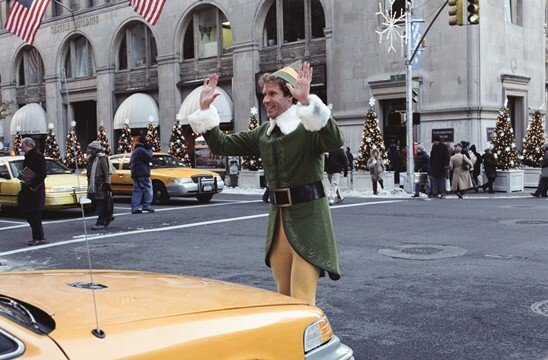 Let Will Ferrell take you there (Elf photo credit: Entertainment Film Distributors). @BAFTA has launched Give Something Back, a campaign to help young people to enter the film, TV and games industries. Could you offer your time as a mentor, or a work placement in your organisation? @creativeengland is inviting applications for their 2m Film Enterprise fund, aimed at improving the growth and sustainability of film-related businesses outside London. 2014 is the centenary year of the First World War, and a programme of cultural activities across all artforms, including film, will launch early next year in commemoration. The annual REMIX London conference was held this week at Google HQ. Missed it? Check out @GdnCulturePro‘s round-up or @British_Film‘s Storify. Box office stats geeks: it’s your lucky day. Cinemas are now required to report all alternative content figures – including theatre, opera, ballet, exhibitions, sports events, music concerts – to Rentrak, who will include it in their official UK box office chart (via @charlesgant). @FL_FLAMIN supported film artist Laure Provost wins the 2014 Turner Prize. @sheffdocfest and Crossover Labs in partnership with @SkillsetSSC have presented Devise to Deliver 3 an 8-month, two stage UK-wide training scheme designed for filmmakers, digital media makers, digital producers and other film professionals. D2D3 provides practical training in producing interactive projects technically, creatively and financially, as well as a guide to innovative ways to fund, distribute and market your films through digital technology. Do you want to work for a film festival? @glasgowfilm festival needs volunteers. You could gain invaluable experience in Front of House, Communications and Coordinator roles. Deadline: 8 Jan.
Filmmakers: ten days left to submit to the @BFI London Lesbian & Gay Film Festival! @PlymShortFilms is looking for entries for its May 2014 festival, deadline 20 April. There are awards a-plenty for category-winning entrants. International submissions of short films from secondary school / undergrad students on global women’s issues are welcomed by @ConnectHer‘s Girls Impact the World Film Festival – deadline 31 Dec.
Another one for the ladies, @Frauenfilmfest needs debut features from female directors – deadline 10 Jan.
Short filmmakers & video artists, London’s @JW3Cinema is looking for work for its Artists’ Film Salon, their new film club. The theme for the first event – scheduled for 17th Feb – is Secrets & Surprises. Get cracking! Annual exhibition @theopenwest is looking for work from up to 40 artists – including those working in film – for submissions for its 2014 edition. Work will be exhibited and three 500 prizes awarded. Deadline: 10 Feb.
@FACT_Liverpool is looking for shorts on the theme of ‘Science Fiction: Myths of the Present Future’. “No efforts are too low budget or otherworldly”, they say. Selected shorts will screen at the venue from March to June next year and the deadline is 17 Jan. Get to it! @HammertoNail is looking for shorts to be screened at US festivals and discussed by their “dedicated audience of online cinephiles”. Deadline: midnight 1 Jan.
CINEASTES EVERYWHERE: send your favourite films of 2013 to worldpoll@sensesofcinema.com for @SensesofCinema‘s annual World Poll, and feel important. Deadline 19 Dec. Check out the 2013 Arts Index, produced by the National Campaign for the Arts (@artscampaign). A ‘health check of the arts in the UK’, it analyses audience statistics and the current funding landscape for arts orgs. Our client cinema, @BarnCinema‘s considerable charms – including their 16th century, Grade I listed converted barn building – are profiled in the latest Cine-Files blog from @guardianfilm, making it the fifth of our venues to be featured (Showroom, Broadway, Stoke Film Theatre, MAC and Saffron Screen have also been written up). About time! Why is the film industry so darn negative?! Isn’t it time filmmakers started to support and champion each other? Via @TedHope. A thoughtful piece from Matthew Taylor of the @theRSAorg, on how arts organisations should re-think their offer to local communities to ensure success when applying for regional funding. “More women worked at all levels inside and outside the Hollywood film industry in the first two decades than at any time since”. While we’re still struggling to get enough women into the UK film industry, read about Hollywood’s early female film pioneers on Columbia University’s Women Film Pioneers Project. And an endearing filmed Christmas card from the East Anglian Film Archive. Happy Christmas!